Flag of Bratstvo, showing the Brotherhood between Chernarussians and Russians. Not all in Chernarus were swept up by the great economic change that the post-2010 reforms brought. Promises were made, platitudes were spouted, and those at the periphery waited for a change which would ultimately never come. The sectarian strife in the ethnic Russian enclaves would continue, the saber rattling would ultimately lead to protests and clashes on the eve of the apocalypse that had now swallowed the world. The scars and deeds of the past had remained, and not for the better. Russian folk in Chernarus felt betrayed, and left behind by the world at large. The Chedaki had managed to give all of them a bad name, after all they were the group that harbored the "treasonous insurrection" against the nation. The post-conflict era had not been friendly to them. They were not allowed to be proud of their background, and their few channels of discourse were frequently shut down by those who saw any attempt by ethnic Russians to better themselves politically as another potential plot to secede from Chernarus and invite the Russian bear in once again. They were sick of the nationalist thugs that often preyed upon their villages while the State either turned a blind eye or participated in the atrocities, despite claims of "Pan-Slavism" for all. This ceaseless treatment had led to a new but meager faction within the local ethnic populace. They were average, everyday Russian folk who were simply tired of being treated like second-class citizens. They were Bratstvo. -Long Term IC Goals- Establish a Safe Haven for all peoples of Chernarus. [By Day 750] Establish a Free Independent State. [Day 1350] Bring the people together in national unity to restore the country. [Day 1200] The eradication of "Bandit groups" that threaten our efforts to rebuild Chernarus. -Short Term IC Goals- Recruit members to support our cause for a strong and unified Chernarus. [Ongoing] Secure a base to begin our operations in the region. [Completed] To eliminate the stigma surrounding Russian ethnic's. [Ongoing] Begin Diplomacy other groups to begin unification to ultimately rebuild the country. [Ongoing] Help the peoples of Chernarus by providing security, food, and shelter for all who need it. [Ongoing] Secure a means to broadcast on a region wide scale. [Ongoing] Begin construction of a large settlement for all peoples. [By Day 734] Setup defenses inside the large settlement. [By Day 746] Complete the Settlement and begin broadcasting its location for all willing to listen. [By Day 750] Leader @DarkestSkies241 - Kazimir Petrov Officer's @Slouchonmycouch - Boris Novez Enlisted @Slider - Nikolai Makkel @Sh4rp - Mikhail Movski @Dylanamo - Vojtch Kucera @Nooty - Anatoly Ashkenazic You must be Chernarussian Or Chernarussian With Russian Ethnicity. Send a PM for further information to @DarkestSkies241 Thanks to @Major for all the graphics and helping us with the lore. Paige was born in Atlanta Georgia into a very wealthy family. She was pampered all her life and was given whatever she wanted by her Dad. Her Dad as a special gift would take her on special trips to visit the world. She would go all over the globe with her parents. one of these trips would be Chernarus… just a week before the outbreak. Her and her Family would get trapped inside Chernarus after the Outbreak and her family would die during it. She now wanders the country alone trying to find a way to survive. She's a silent person but speaks up. Brad Williams was born to a middle class family in Loveland, Colorado in Feb, 3 1993. There he met his long time friend Tyler Austin who would later in life become his camera man. Brad Williams went to Denver later in life where he went to The Art Institute of Colorado. He always had a thing for photography and news reporting and anything related to that. His friend Tyler joined him along on his journey through life. Later when Tyler and Brad were in Wyoming taking photo's of the landscaped where they were attacked by wolf's They Managed to scare them off with a flare gun but Brad was cut in the face by one giving him the scar on his Lip. 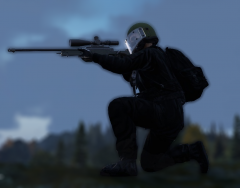 After a while of working for local News stations he later sought a career in the U.K. For a British New Organization Where he was sent to Chernarus in 2017 to report protests, political demonstrations, and calls for secession, in Northern South Zagoria and Belozersk, and reported on the Martial Law that followed. He later reported on what happed during the first two weeks of the outbreak. His friend Tyler died during the outbreak so now Brad wonders the country alone helping whoever he can but sticking to himself calling himself "Dark".